iStopMotion Pro 2.7 from Boinx Software is a program that assists in the creation of stop motion animation—the process of moving objects slightly between shots which, when played back, gives the illusion of motion. Think: the original King Kong or Wallace and Gromit—everyone’s seen this stuff. iStopMotion Pro 2.7 is targeted to the top level of such creation skills. Two other variations of the same software—iStopMotion Home ($49) and iStopMotion Express ($99), are the very simple and advanced amateur versions of the program, respectively. Whether you're a doodling amateur or a motion graphics pro, iStopMotion's three versions are all very simple to learn and easy to use and do what Boinx says they will do. However, the Pro version at $499 is not nearly as "pro" as the highest end users would demand—it lacks a Live View and other useful pro-level features—and the price differential of $400 between the Express and the Pro versions of the product raises questions. Setup is cake: drag install, launch, enter your info, and iStopMotion immediately presents you with a video that clearly and simply explains the software. Connect a supported camera, choose a resolution, frame rate, and save location for the movie, and you're ready to begin working. 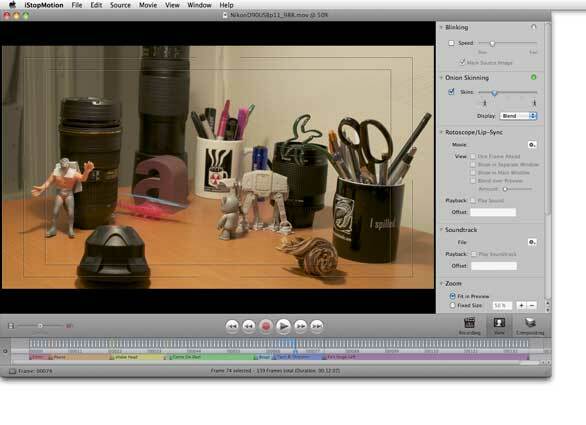 If you are working with a video camera, just move your props and take a frame grab (which gets added to the timeline). That frame is displayed at 50 percent opacity over the live video feed in a process known as onion skinning. You can choose how many prior frames to "onion skin" over the working frame, giving a visual history of your animation. You can play back your animation timeline at any time, as well as copy, paste, or move frames around the timeline. The onion skinning feature allows you to see a “ghost” of the prior frames, such as the retreating helicopter. Notice the handy colored timeline markers to plot out your evil machinations. As you animate, there is a very rudimentary on-capture color correction tool available that applies only to the frame you are about to capture (but not prior frames), as well as a Tilt Shift filter that can be used on the current frame to give larger sets a miniaturized look. A serious limitation, however, is that these filters have to be, and can only be, applied at the moment of capture—no changing your mind later. I'd rather use better tools later in the process that I can edit and tweak rather than lock in a look at acquisition. You can use a variety of cameras with iStopMotion Pro—it supports FireWire DV/HDV cameras, as well as many webcams, point and shoots, and DSLRs. Video capable cameras attached over SDI (Serial Digital Interface), HD-SDI, or HDMI connections are also supported if you have an appropriate video capture card. Boinx’s Website has a long list of cameras that have been tested, but not all of them work. Disappointingly, while many Nikon and Canon DSLRs are supported, the modern Live View feature that works over USB is not supported with iStopMotion Pro. Note, however, that under OS X 10.6.5 and 10.6.6 support for most Canon DSLRs was lost for iStopMotion Pro, although the company says it is working on a fix. This means you can't get live video feedback on screen as you move your props around, which hugely slows down your animation process. Also not supported are FireWire based DVCPRO HD cameras nor popular AVCHD cameras. Once you are set up and working, the software is quick and easy (at least with video sources). There are plenty of keyboard shortcuts to keep your workflow humming, and you can even use the Apple Remote for various capture and playback tasks. The onion-skinning feature makes seeing what you're doing (even replacing a middle frame) much easier. Markers allow you to plot out your events on the timeline, and the movie overlay and soundtrack functions allow animating to audio for lip synch and/or rotoscope work. User adjustable grids and title/action safe overlays also aid production. Once done, the handy Send To iMovie (or Final Cut Pro) option allows for easy export to YouTube, MobileMe, iPhone, and other presets from those applications. Unlike the software Nikon and Canon provide for their cameras, iStopMotion cannot use the Live View function over USB to give live video feedback as you position your props. Note the color correction and tilt shift options on the right for use during recording. Unfortunately, while the Boinx Website says multiple cameras can be used at the same time to record multiple camera angles, the software crashed whenever I tried that with the cameras I had on hand—a Red One over HD-SDI and a Nikon D300S over USB feeding into an 8 Core Mac Pro tower. Other configurations are reported to work. Unfortunately, this one did not, and it is not particularly high-end or unusual for a pro-level video editor. Other limitations for professionals include only one choice of capture—the 8-bit None Quicktime codec. Capturing higher quality RAW frames from DSLRs also isn’t possible, and only whole number frame rates are supported—no 23.976 or 29.97 fps. 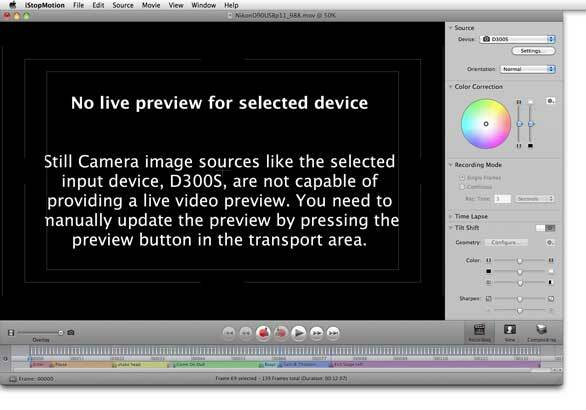 You can only capture the USB preview from DSLRs. While you can use DVCPRO HD if the codec is installed (such as from Final Cut Pro), AVCHD is not supported under any circumstances. You also cannot change the framing if, for example, you’re recording a 16:9 movie from a 4:3 aspect camera source, but at least various pixel aspect ratios (such as for HDV) are supported. Below is a sample stop motion video made with iStopMotion Pro, with a little help from other programs for the zap and text. Walkin' da At-At from Mike Curtis on Vimeo. At first I was excited about what iStopMotion Pro 2.7 could do—the onion skinning, the long list of supported cameras, color correction and Tilt Shift filters, movie overlays, and DSLR support over USB. All good! But the more I worked with it, the less satisfied I was. Without greater than 8-bit capture, Live View previewing, support for the popular AVCHD format, and RAW DSLR support—I seriously question the validity of the software's Pro moniker. If all you want to do is stop-motion animation and need some tools to help you see what you're doing, this program will definitely get you there pleasantly. It is only if you are looking for truly professional level input and controls you will find this product lacking. I found iStopMotion 2.7 to be reliable and easy to use, but limiting for the kinds of professional production I'd like to do with it, and too expensive for what it does do.